I used two China Glaze polishes. 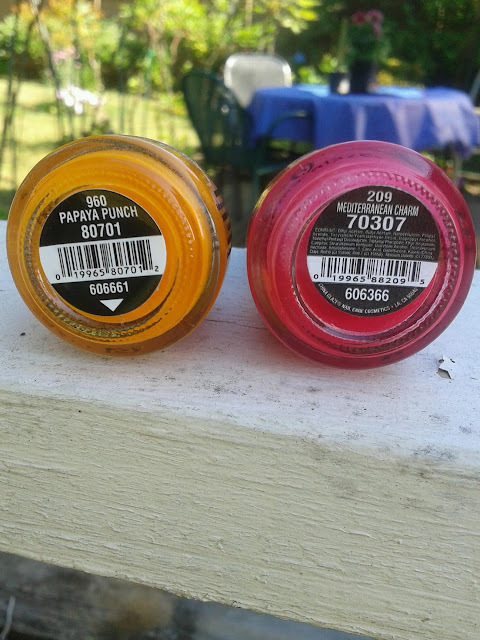 One in a bright yellow-orange (Papaya Punch) and one in a darker hot pink (Mediterranean Charm). I believe Papaya Punch was limited edition from a couple years back in their Island Escape collection but you can find it on Amazon HERE. Mediterannean Charm is part of their everyday collection so you can find it HERE. Papaya Charm was a little thick and harder to work with (most likely because it is older). I recommend keeping it in your fridge before hand to make it easier to work with. It took me about 2 coats to cover any streaking. Mediterranean Charm was very easy to work with. The polish wasn't as thick and was very smooth to apply. If I wanted a sheer color, I could have gotten away with 1 coat with no streaks, but I did use 2 coats so it would be opaque. 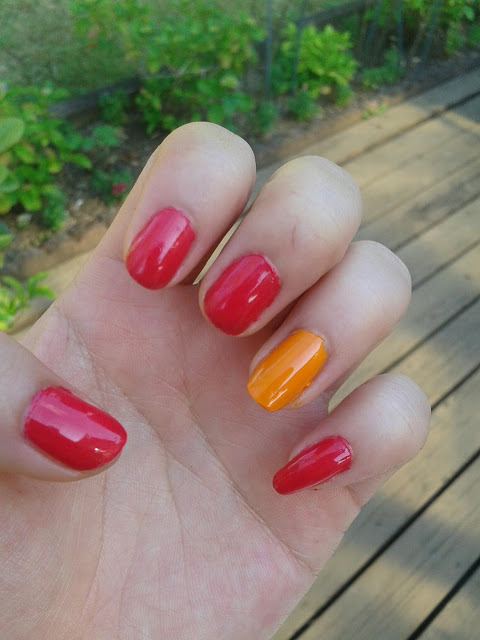 I topped it off with Revlon's Colorstay Top Coat. I've had the polish on for 3 days and there is only a small chip on one of my fingers for the pink color. There is some that are wearing away at the very tips but it is hard to notice. 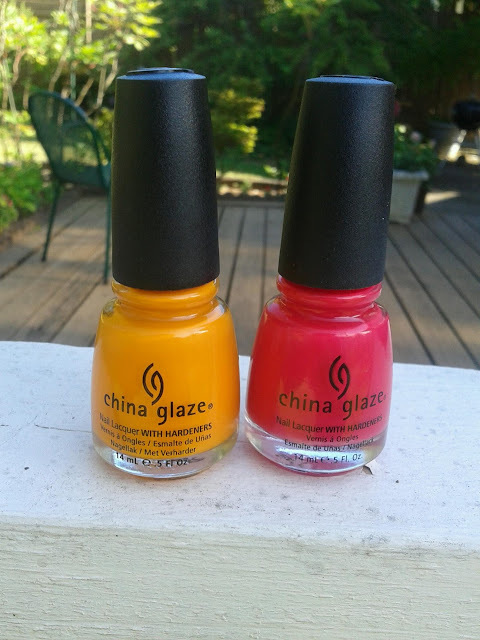 Overall, I love these colors and find that they are perfect and bright for summer. Wow, I really like your blog. Nice post! I think I will be here more often if you know what I mean ;) I'm your new follower! love this red colour! Don't forget to check out my blog&facebookpage&youtubechannel! Thanks for stopping by and the add! I never thought of this color to be too red, but in reality it is more of a reddish-pink!